, an eminent statesman, almoner to Henry VIII. and bishop of Hereford, was born at Dursley, in Gloucestershire; but it is not mentioned in what year. After passing through Eton school he was admitted of King’s college in Cambridge, 1512, where he was elected provost in 1528, and continued in that office till his death. Being recommended to cardinal Wolsey as a man of an acute spirit and political turn, he was taken into his service; and, according to Lloyd, was the person who encouraged the cardinal to aspire to the papacy. In 1528 he was sent ambassador to Rome, jointly with Stephen Gardiner, afterwards bishop of Winchester, in order to obtain bulls from Clement VII. for Henry’s divorce from Catherine of Arragon. He was then almoner to the king; and reputed, as Burnet says, one of the best diviues ia England. He was afterwards employed in embassies both in France and Germany; during which, as he was one day discoursing upon terms of peace, he said, “honourable ones last long, but the dishonourable, no longer than till kings have power to break them the surest?way, therefore, to peace, is a constant prepared ness for war.” Two things, he would say, must support a government, “gold and iron: gold, to reward its friends; and iron, to keep under its enemies.” It was to him that Cranmer owed his first introduction to court, with all its important results. 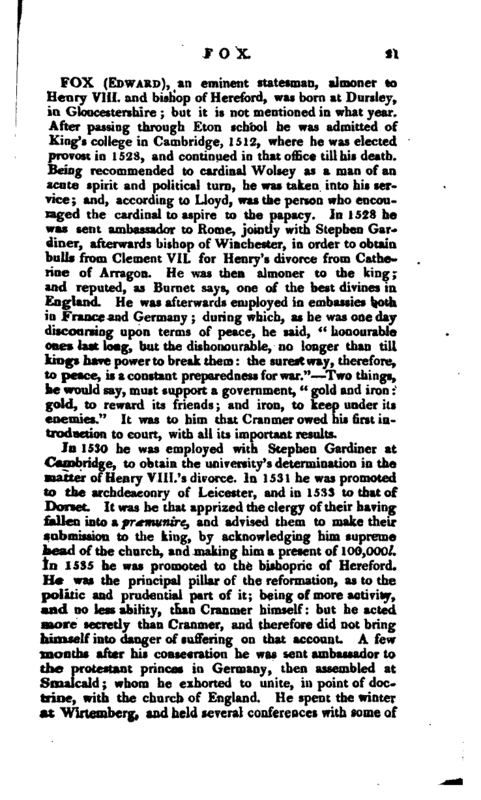 In 1530 he was employed with Stephen Gardiner at Cambridge, to obtain the university’s determination in the matter of Henry VIIL's divorce. In 1531 he was promoted to the archdeaconry of Leicester, and in 1533 to that of Dorset It was he that apprized the clergy of their having fallen into a prawunire, and advised them to make their submission to the king, by acknowledging him supreme head of the church, and making him a present of 1 -00,0001. In 1535 he was promoted to the bishopric of HerefordHe was the principal pillar of the reformation, as to the politic and prudential part of it; being of more activity, and no less ability, than Cranmer himself: but he acted more secretly than Cranmer, and therefore did not bring himself into danger of suffering on that account. A few months after his consecration he was sent ambassador to the protestaut princes in Germany, then assembled at Smalcald; whom he exhorted to unite, in point of doctrine, with the church of England. He spent the winter at Wirtemberg, and held several conferences with some of | the German divines, endeavouring to conclude a treaty with them upon many articles of religion: but nothing was effected. Burnet has given a particular account of this negociation in his “History of the Reformation.” He returned to England in 1536, and died at London, May 8, 1533. 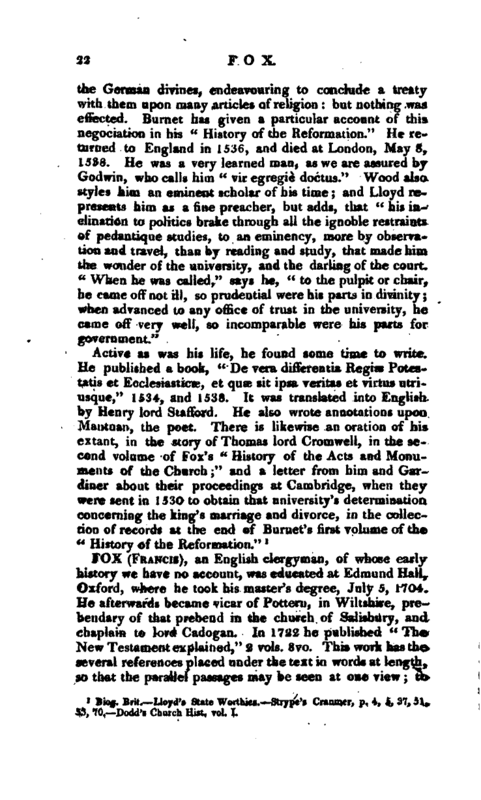 He was a very learned man, as we are assured by Godwin, who calls him “vir egregie doctus.” Wood also styles him an eminent scholar of his time; and Lloyd represents him as a tine preacher, but adds, that “his inclination to politics brake through all the ignoble restraints of pedantique studies, to an eminency, more by observation and travel, than by reading and study, that made him the wonder of the university, and the darling of the court.” When he was called,“says he,” to the pulpit or chair, he came off not ill, so prudential were his parts in divinity; when advanced to any office of trust in the university, he came off very well, so incomparable were his parts for government." Biog Brit. Lloyd’s State Worthies. Slrype’s Cranmer, p. 4, t, 37, 31, M, 10. Dodd’s Church HiU. vol. J.